Anonymous artist group LuzInterruptus rattled the crowds at Hamburg’s Dockville Festival with a haunting installation that reminds us of the dangers of nuclear power. The Spanish collective is known for creating guerilla LED light installations throughout the streets of Madrid that they call “interventions.” Their work often features slightly illuminated everyday materials and figures that would otherwise go unnoticed. 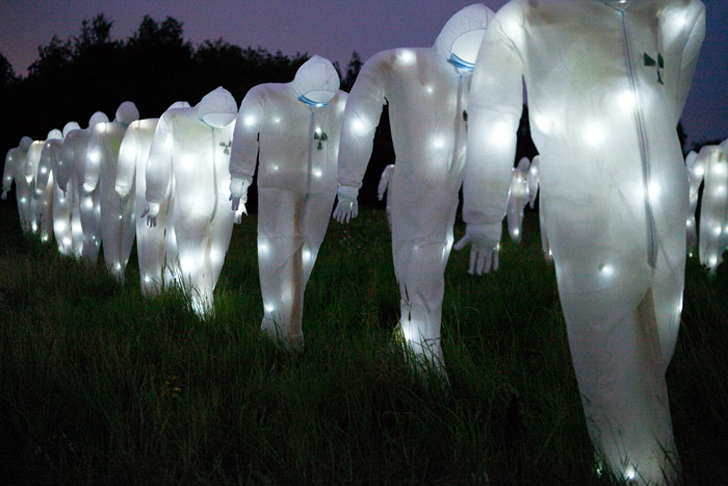 This particular intervention titled “Radioactive Control” consists of 100 decontamination suits propped up like scarecrows, each illuminated with tiny LED lights. The arrangement of suits forms what looks like a small army. Certainly an artistic intervention, the piece literally sheds light on the hazards of nuclear energy. The harrowing presence of these figures encourages reflection and thought about the consequences of using nuclear power and how radioactive waste can and has invaded our environment. The installation is set against a rural landscape and has a haunting effect on visitors, who can walk through the arrangement and immerse themselves in the formation, standing face to face with the figures. They may wonder if this could be our future, and whether we should get used to seeing this? Irony does not fall short of this project however, as Germany was the first developed country to announce the abolition of nuclear power by the year 2022. LuzInterruptus is interested in the ephemeral aspects of making art as well. Something that may disappear in days or weeks can leave an impression forever. Similarly, world issue can be headline news one day and forgotten the next. The exhibition will stand for 30 days, withstanding the weather. The illuminated figures could also be seen as a sort of vigil for those lost in nuclear disasters. The sheer number of radiation-related deaths is something difficult to ignore. Nuclear power is frightening to some because the dangers are "obvious" and the easily quantifiable damages from accidents are long-lasting. What is really frightening to me is the less obvious dangers of poisoning our planet with pollution from fossil fuels, and the time scale that it may take for the planet to heal from this. A nuclear accident affects the surrounding region. The pollution from fossil fuels affects the whole planet. Would you rather have a broken bone that is painful over the months it takes to heal, or an invisible cancer that over the course of years destroys your immune system? You both make valid points and I genuinely welcome the perspective you're contributing to the discussion. You're right, the benefits of nuclear energy should be explored further in popular conscious. Its assets are greater than many of us know and we have blinded ourselves by fixating on its flaws. At the same time though, we have confronted these tragic catastrophes on a scale that was formerly unimaginable. Chernobyl, Fukishma and threats of nuclear warfare will continue continue to haunt us. You don't just get over that. So while it may be so that nuclear energy is the best option we've got - and I really don't mean that sarcastically - I think that criticizing Luzinterruptus's this piece for its negative tone is fair. The the discussion its ominous figures provokes is compelling and necessary so that we develop a perspective that takes all angles into account. Maybe you're right and popular conscious has become too pessimistic about the directions modernity has taken? Or perhaps we can't handle this level of complexity of our global, urban, secular world. Knollgrass is correct; an intergovernmental group of European scientists working o a project called ExternE assessed the risk of all widely used power-generation technologies, normalized as expected deaths per terawatt-hour of electricity produced. Nuclear power was indeed safest, even counting the Chernobyl accident. It is comparable to wind and solar. The risks from those technologies mainly come from manufacturing, installation and maintenance -- essentially, industrial accidents. Falls from a height are the most common cause of death in construction. Wind and (rooftop) solar both involve construction at heights. It will take some time to read, but if you have an open mind on the subject there are lots of peer-reviewed citations in this expanded version of a talk I gave at my kids' school after Fukushima, entitled "A Rational Environmentalist's Guide to Nuclear Power": http://www.scribd.com/doc/54904454 I hope you don't regard this a "gratuitous" since it's directly on point. I can't believe this. As it stands nuclear power is the safest form of energy generation beating out wind and solar. And the next generation of reactors like the Liquid Fluoride Thorium Reactors are 100 times more safe and efficient. Give me an apples to apples comparison and nuclear will always win out. BTW google Liquid Fluoride Thorium Reactors and watch some of Kirk Sorenson's lectures. This particular intervention titled "Radioactive Control" consists of 100 decontamination suits propped up like scarecrows, each illuminated with tiny LED lights. The arrangement of suits forms what looks like a small army. Certainly an artistic intervention, the piece literally sheds light on the hazards of nuclear energy. The harrowing presence of these figures encourages reflection and thought about the consequences of using nuclear power and how radioactive waste can and has invaded our environment. 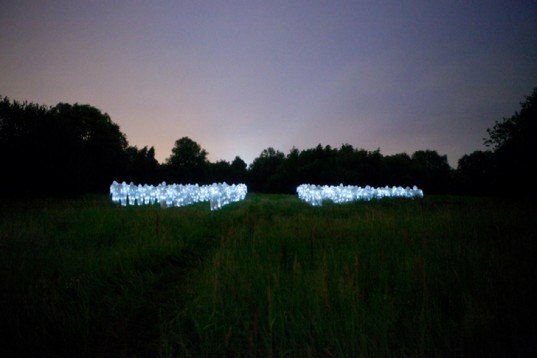 The installation is set against a rural landscape and has a haunting effect on visitors, who can walk through the arrangement and immerse themselves in the formation, standing face to face with the figures. They may wonder if this could be our future, and whether we should get used to seeing this? Irony does not fall short of this project however, as Germany was the first developed country to announce the abolition of nuclear power by the year 2022. The project also has an ironic edge, as, as Germany was the first developed country to announce the abolition of nuclear power by the year 2022.